Publishing Seven was a big step. It wasn't the first novel I've written, but it was the first that I thought was ready to set loose upon the world. I do have a handful of other novels buried in my digital filing cabinet (one completed and a half-dozen unfinished, if you're keeping score at home), and I expect that they'll see the light of day in some form in the future, whether that be through extensive revision/rewriting or by incorporating the characters and/or story-lines into a new project. But in addition to those novels, I have over fifty shorter tales burning a hole in my back catalog, varying in length from flash-fiction (1,000 words or less) to novellas roughly a third the length of Seven. While not all of these are ready for publication now (and some probably never will be! ), I have had enough positive feedback from writers' groups that I feel confident in publishing some of them. But how best to release them? One at a time? In a massive collection? How about we split the difference and sort of manage to do both at the same time? Throughout 2014, I'll be adding some final spit-and-polish to these short stories and releasing them in six e-book installments, with each installment set to feature one novella or a collection of up to five stories. The word count for each installment will be in the 13,000 to 18,000 range (novella length), and they will be sold at 99¢ each. Though the stories will range across science fiction, fantasy, horror, and the paranormal (oft-times combining genres, as is my wont *grin*), each installment will feature stories in roughly similar styles and/or genres. At the end of the year, the plan is to combine all of the installments, along with any other tales that I feel are worthy of publication but didn't fit into any of the installments, as a single large collection in both e-book and print format (prices yet to be determined). At least, that's the plan anyway. And what better time to start than now? 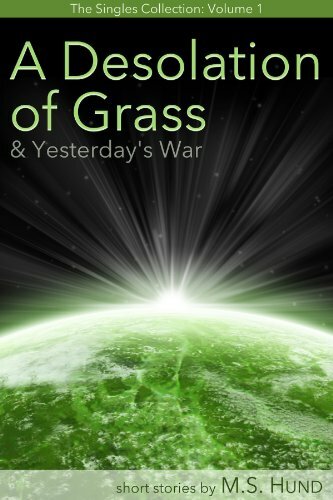 The first of the six installments, A Desolation of Grass & Yesterday's War, includes two long short stories, both broadly in the military science fiction vein, though there are elements of westerns, occult horror, colonization, coming of age, and space opera also on offer. It will be available as a Kindle book from Amazon in the next week or so and should be available across all the major e-book sellers (iBooks, Kobo, Nook, etc.) before the end of the month. So keep your eyes peeled for the "new release" announcement or sign up for my mailing list to make sure you don't miss it. The mailing list will always be the first place to hear about my new releases, as well as sales, giveaways, and contests, and I promise it will never be spammy or unbearably frequent.